Sometimes a girl needs to getaway for a weekend. Sun, beach, sleeping, cocktails, sand, eating, hiking…you know what I mean? The thing is – what might be a summer getaway for me, might be completely different for you. It could be exploring somewhere new, relaxing with good food and lots of sleep, spending the days relaxing at the beach and surfing, or enjoying a little getaway. 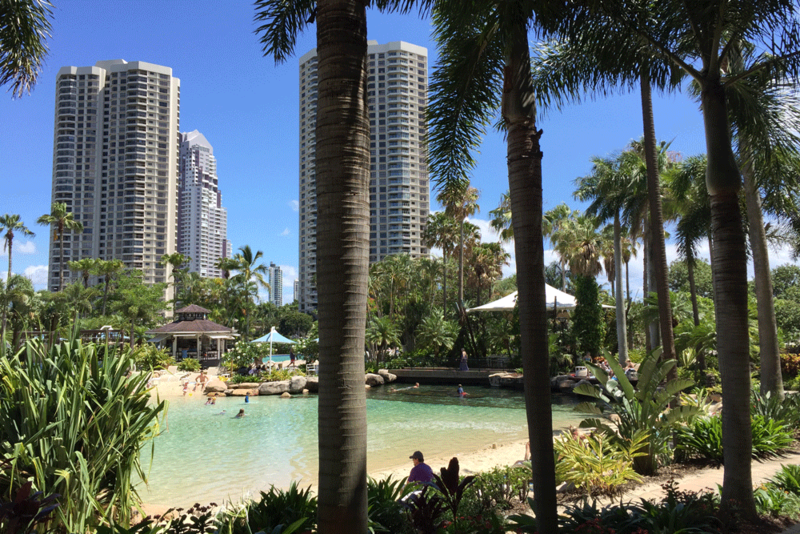 When the Marriott at Surfers Paradise recently asked me what I love to do most during the warm summer months, I knew straight away a weekend getaway was it, especially where I could be my summer self. So how do I have the best weekend getaway close to home? I use this checklist below! LOCATION The perfect getaway weekend is not about jumping on a plane or driving for eight hours to get to your destination. It’s about choosing a location close to home, but far away enough to feel like you’re actually on a getaway. I suggest a three hour drive to your destination is the maximum time you want to spend to get to your destination. ACCOMMODATION I live on the Sunshine Coast in Queensland, Australia so my favourite getaway spots close to home are the Gold Coast and Byron Bay. I have been spending a bit of time in Byron Bay recently, so for this getaway I decided to stay at the Marriott at Surfers Paradise the Gold Coast. Plus it’s only a two hour drive from home – hurrah! EAT A getaway weekend is usually for three days and two nights, so I didn’t want to spend my entire weekend driving to cafes and restaurants. Lucky for me, my stay at the Marriott included a full buffet breakfast (hello food). Interestingly, the hotel also has a Japanese steakhouse – Misono – where I enjoyed Tepinyaki for the first time, and an afternoon lounge – Chapter & Verse – where I could enjoy a few afternoon light eats and a cocktail, or three. When I wanted to jump in the car to grab a bite to eat, I went to a couple of my favourite spots on the Gold Coast, Commune, Vice Baby and Grocer & Grind. SEE & DO What I love most about getaway weekend’s is you can do as little or as much as you want to. As a general rule, I like to relaxo rancho on the first day, go and see something new on the second day, and then relaxo rancho on the third day. As you know I love to hike and explore nature, and I have wanted to explore Lamington National Park for aaaaaages. So a drive into the Gold Coast hinterland to watch the sunset from the National Park was the perfect excuse to be my summer self. And surfing at Burleigh Heads, always. DO Second to the location of your getaway weekend is the things to do, and particularly, things to do where you stay – especially in summer. And for me, it’s all about the hotel pool. It has to be excellent because if you stay by the beach, and it’s super windy, chances are you won’t go to the beach and you’ll want an amazing pool to relax by. And the pool at the Marriott? Ding ding ding! Pool of my dreams! Additionally, exercise is very important to me. Especially when I am on the road. Whilst many, many of you won’t want to do any form of exercise on your getaway, if I don’t, I feel grumpy. I prefer to exercise outdoors, but sometimes its way more convenient to exercise close to where I am staying, or preferably, where I am staying. I always make sure there is a gym at the hotel, and the gym where I stay. So when you are deciding on your own mini getaway, what do you need to decide to ensure it’s the best weekend ever?